take the subway to the Queen’s Park station at College and University, then walk one block west to McCaul. the 506 CARLTON streetcar stops at College and McCaul. For more information visit the TTC website. Detailed information about parking at the University of Toronto is available from Parking and Transporation Services. Parking is limited on weekdays. The closest U of T parking is on King’s College Circle (map). There are several parking garages on Murray Street near Mount Sinai Hospital and Toronto Rehab. Street parking (three-hour maximum) is available on McCaul Street. There is a U of T parking lot behind the Health Sciences Building at 155 College Street. Enter off McCaul Street just south of College Street (map). It offers a flat rate on Saturdays and Sundays. 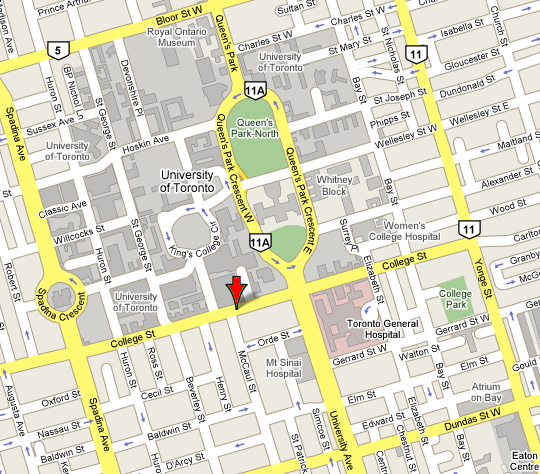 There is a U of T parking lot at 256 McCaul Street just south of College Street (map). It offers a flat rate on Saturdays and Sundays. There is more U of T parking on King’s College Circle (map). It offers a flat rate on Saturdays and Sundays. Below are lists of hotels, residences and Bed & Breakfast accommodations that are close to the Lawrence S. Bloomberg Faculty of Nursing. This information is presented as a matter of service only, and does not constitute a recommendation of the locations listed. A map shows the locations of hotels near the Lawrence S. Bloomberg Faculty of Nursing. University of Toronto Student Housing Service offers a list of temporary accommodations. Inexpensive on campus summer accommodations are available from early May until late August. From September through April short term accommodations are not available on campus.